The Dreamtime or Dreaming stories, songlines, or Aboriginal oral literature) are the stories traditionally performed by Aboriginal peoples within each of the language groups across Australia. All such myths variously tell significant truths within each Aboriginal group's local landscape. They effectively layer the whole of the Australian continent's topography with cultural nuance and deeper meaning, and empower selected audiences with the accumulated wisdom and knowledge of Australian Aboriginal ancestors back to time immemorial. Australian Aboriginal mythologies have been characterised as "at one and the same time fragments of a catechism, a liturgical manual, a history of civilization, a geography textbook, and to a much smaller extent a manual of cosmography." Dixon observed from the evidence available that Aboriginal myths regarding the origin of the Crater Lakes might be dated as accurate back to 10,000 years ago. Further investigation of the material by the Australian Heritage Commission led to the Crater Lakes myth being listed nationally on the Register of the National Estate, and included within Australia's World Heritage nomination of the wet tropical forests, as an "unparalleled human record of events dating back to the Pleistocene era." the Port Phillip myth (recorded as told to Robert Russell in 1850), describing Port Phillip Bay as once dry land, and the course of the Yarra River being once different, following what was then Carrum Carrum swamp. the Great Barrier Reef coastline myth (told to Dixon) in Yarrabah, just south of Cairns, telling of a past coastline (since flooded) which stood at the edge of the current Great Barrier Reef, and naming places now completely submerged after the forest types and trees that once grew there. the Lake Eyre myths (recorded by J. W. Gregory in 1906), telling of the deserts of Central Australia as once having been fertile, well-watered plains, and the deserts around present Lake Eyre having been one continuous garden. This oral story matches geologists' understanding that there was a wet phase to the early Holocene when the lake would have had permanent water. 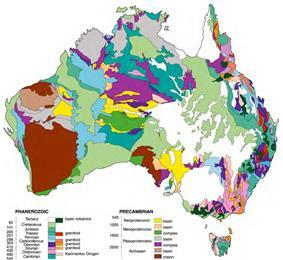 There are 900 distinct Aboriginal groups across Australia, each distinguished by unique names usually identifying particular languages, dialects, or distinctive speech mannerisms. Each language was used for original myths, from which the distinctive words and names of individual myths derive. The Encyclopaedia of Aboriginal Australia nevertheless observes: "One intriguing feature [of Aboriginal Australian mythology] is the mixture of diversity and similarity in myths across the entire continent." "..they generally describe the journeys of ancestral beings, often giant animals or people, over what began as a featureless domain. Mountains, rivers, waterholes, animal and plant species, and other natural and cultural resources came into being as a result of events which took place during these Dreamtime journeys. Their existence in present-day landscapes is seen by many indigenous peoples as confirmation of their creation beliefs.."
"..The routes taken by the Creator Beings in their Dreamtime journeys across land and sea.. link many sacred sites together in a web of Dreamtime tracks criss-crossing the country. Dreaming tracks can run for hundreds, even thousands of kilometres, from desert to the coast [and] may be shared by peoples in countries through which the tracks pass.."
"It is always integral and common.. that the Law (Aboriginal law) is something derived from ancestral peoples or Dreamings and is passed down the generations in a continuous line. While..entitlements of particular human beings may come and go, the underlying relationships between foundational Dreamings and certain landscapes are theoretically eternal ... the entitlements of people to places are usually regarded strongest when those people enjoy a relationship of identity with one or more Dreamings of that place. This is an identity of spirit, a consubstantiality, rather than a matter of mere belief..: the Dreaming pre-exists and persists, while its human incarnations are temporary." "Aboriginal people learned from their stories that a society must not be human-centred but rather land centred, otherwise they forget their source and purpose ... humans are prone to exploitative behaviour if not constantly reminded they are interconnected with the rest of creation, that they as individuals are only temporal in time, and past and future generations must be included in their perception of their purpose in life." "People come and go but the Land, and stories about the Land, stay. This is a wisdom that takes lifetimes of listening, observing and experiencing ... There is a deep understanding of human nature and the environment.. sites hold 'feelings' which cannot be described in physical terms.. subtle feelings that resonate through the bodies of these people.. It is only when talking and being with these people that these 'feelings' can truly be appreciated. This is.. the intangible reality of these people.."
In 1926 a British anthropologist specialising in Australian Aboriginal ethnology and ethnography, Professor Alfred Radcliffe-Brown, noted many Aboriginal groups widely distributed across the Australian continent all appeared to share variations of a single (common) myth telling of an unusually powerful, often creative, often dangerous snake or serpent of sometimes enormous size closely associated with the rainbows, rain, rivers, and deep waterholes. Kanmare (Boulia, Queensland); Tulloun: (Mount Isa, Queensland); Andrenjinyi (Pennefather River, Queensland), Takkan (Maryborough, Queensland); Targan (Brisbane, Queensland); Kurreah (Broken Hill, New South Wales);Wawi (Riverina, New South Wales), Neitee & Yeutta (Wilcannia, New South Wales), Myndie (Melbourne, Victoria); Bunyip (Western Victoria); Arkaroo (Flinders Ranges, South Australia); Wogal (Perth, Western Australia); Wanamangura (Laverton, Western Australia); Kajura (Carnarvon, Western Australia); Numereji (Kakadu, Northern Territory). This 'Rainbow Serpent' is generally and variously identified by those who tell 'Rainbow Serpent' myths, as a snake of some enormous size often living within the deepest waterholes of many of Australia's waterways; descended from that larger being visible as a dark streak in the Milky Way, it reveals itself to people in this world as a rainbow as it moves through water and rain, shaping landscapes, naming and singing of places, swallowing and sometimes drowning people; strengthening the knowledgeable with rainmaking and healing powers; blighting others with sores, weakness, illness, and death. ^ Myers, E. (1986) Pintupi Country, Pintubi Self: Sentiment, Place and Politics among Western Desert Aborigines. Australian Institute of Aboriginal Studies, Canberra & Smithsonian Institution, Washington, D.C.
Cowan, James (1994) Myths of the dreaming: interpreting Aboriginal legends. Unity Press. Roseville, N. S. W.
Within this Pintupi world view, three long geographical tracks of named places dominate, being interrelated strings of significant places named and created by mythic characters on their routes through the Pintupi desert region during the Dreaming. It is a complex mythology of narratives, songs and ceremonies known to the Pintupi as Tingarri. It is most completely told and performed by Pintupi peoples at larger gatherings within Pintupi country. "These human creations are objectified – thrust out – into principles or precedents for the immediate world.. Consequently, current action is not understood as the result of human alliances, creations, and choices, but is seen as imposed by an embracing, cosmic order." "The Dreaming.. provides a moral authority lying outside the individual will and outside human creation.. although the Dreaming as an ordering of the cosmos is presumably a product of historical events, such an origin is denied." Scholars of the Pintupi peoples (from within Australia's Gibson Desert region) believe they have a predominantly 'mythic' form of consciousness, within which events occur and are explained by the preordained social structures and orders told of, sung about, and performed within their superhuman mythology, rather than by reference to the possible accumulated political actions, decisions and influences of local individuals (i.e. this understanding effectively 'erases' history). Within the myth and in its performance, young, unadorned children must first be swallowed by an ancestral being (who transforms into a giant snake), then regurgitated before being accepted as young adults with all the rights and privileges of young adults. 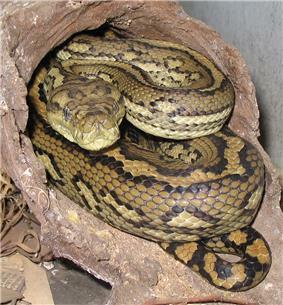 "A woman, Mutjinga (the 'Old Woman'), was in charge of young children, but instead of watching out for them during their parents' absence, she swallowed them and tried to escape as a giant snake. The people followed her, spearing her and removing the undigested children from the body." The following Murrinh-patha myth, for instance, is performed in Murrinh-patha ceremonies to initiate young men into adulthood. Animating and sustaining this Murrinh-patha mythology is an underlying philosophy of life that has been characterised by Stanner as a belief that life is "... a joyous thing with maggots at its centre.". Life is good and benevolent, but throughout life's journey, there are numerous painful sufferings that each individual must come to understand and endure as he grows. This is the underlying message repeatedly being told within the Murrinh-patha myths. It is this philosophy that gives Murrinh-patha people motive and meaning in life. "In fact, the isomorphic fit between the natural and supernatural means that all nature is coded and charged by the sacred, while the sacred is everywhere within the physical landscape. Myths and mythic tracks cross over.. thousands of miles, and every particular form and feature of the terrain has a well-developed 'story' behind it." In particular, scholars suggest the Murrinh-patha have a oneness of thought, belief, and expression unequalled within Christianity, as they see all aspects of their lives, thoughts and culture as under the continuing influence of their Dreaming. Within this Aboriginal religion, no distinction is drawn between things spiritual/ideal/mental and things material; nor is any distinction drawn between things sacred and things profane: rather all life is 'sacred', all conduct has 'moral' implication, and all life's meaning arises out of this eternal, everpresent Dreaming. The Murrinh-Patha people (whose country is the saltwater country immediately inland from the town of Wadeye) describe a Dreamtime in their myths which anthropologists believe is a religious belief equivalent to, though wholly different from, most of the world's other significant religious beliefs. Victoria River (Northern Territory): it is told in a Captain Cook saga that Captain Cook sailed from London to Sydney to acquire land. Admiring the country, he landed bullocks and men with firearms, following which local Aboriginal peoples in the Sydney area were massacred. Captain Cook made his way to Darwin, where he sent armed horsemen to hunt down the Aborigines in the Victoria River country, founding the city of Darwin and giving police plus cattle station managers orders on how to treat Aborigines. Kimberley (Western Australia): Numerous Aboriginal myth-tellers say that Captain Cook is a European culture hero who landed in Australia. Using gunpowder, he set a precedent for the treatment of Aboriginal peoples throughout Australia, including the Kimberley. On returning to his home, he claimed he had not seen any Aboriginal peoples, and advised that the country was a vast and empty land which settlers could come and claim for themselves. In this myth, Captain Cook introduced 'Cook's Law', upon which the settlers rely. The Aboriginals note, however, that this is a recent, unjust and false law compared to Aboriginal law. "set up the people [cattle industry] to go down the countryside and shoot people down, just like animal, they left them lying there for the hawks and crows.. So a lot of old people and young people were struck by the head with the end of a gun and left there. They wanted to get the people wiped out because Europeans in Queensland had to run their stock: horses and cattle." Batemans Bay, New South Wales: Percy Mumbulla told of Captain Cook's arriving on a large ship which anchored at Snapper Island, from which he disembarked to give the myth-teller's predecessors clothes (to wear) and hard biscuits (to eat). Then he returned to his ship and sailed away. Mumbulla told how his predecessors rejected Captain Cook's gifts, throwing them into the sea. Cardwell, Queensland: Chloe Grant and Rosie Runaway told of how Captain Cook and his group seemed to stand up out of the sea with the white skin of ancestral spirits, returning to their descendants. Captain Cook arrived first offering a pipe and tobacco to smoke (which was dismissed as a 'burning thing.. stuck in his mouth'), then boiling a billy of tea (which was dismissed as scalding 'dirty water'), next baking flour on the coals (which was rejected as smelling 'stale' and thrown away untasted), finally boiling beef (which smelled well, and tasted okay, once the salty skin was wiped off). Captain Cook and group then left, sailing away to the north, leaving Chloe Grant and Rosie Runaway's predecessors beating the ground with their fists, fearfully sorry to see the spirits of their ancestors depart in this way. The many Aboriginal versions of this 'Captain Cook' are rarely oral recollections of encounters with the Lieutenant James Cook who first navigated and mapped Australia's east coast on the HM Bark Endeavour in 1770. Guugu Yimidhirr predecessors, along the Endeavour River, did encounter James Cook during a 7-week period beached at the site of the present town of Cooktown while the Endeavour was being repaired. From this time the Guugu Yimidhirr did receive present-day names for places occurring in their local landscape; and the Guugu Yimmidhir may recollect this encounter. This key mythical character is most often named 'Captain Cook', this being a 'mythical' character shared with the broader Australian community, who also attribute James Cook with playing a key role in colonising Australia. The Aboriginal 'Captain Cook' is attributed with bringing British rule to Australia, but his arrival is not celebrated. More often within the Aboriginal telling, he proves to be a villain. A number of linguists, anthropologists and others have formally documented another common Aboriginal myth occurring across Australia. Predecessors of the myth tellers encounter a mythical, exotic (most often English) character who arrives from the sea, bringing western colonialism, either offering gifts to the performer's predecessors or bringing great harm upon the performer's predecessors.